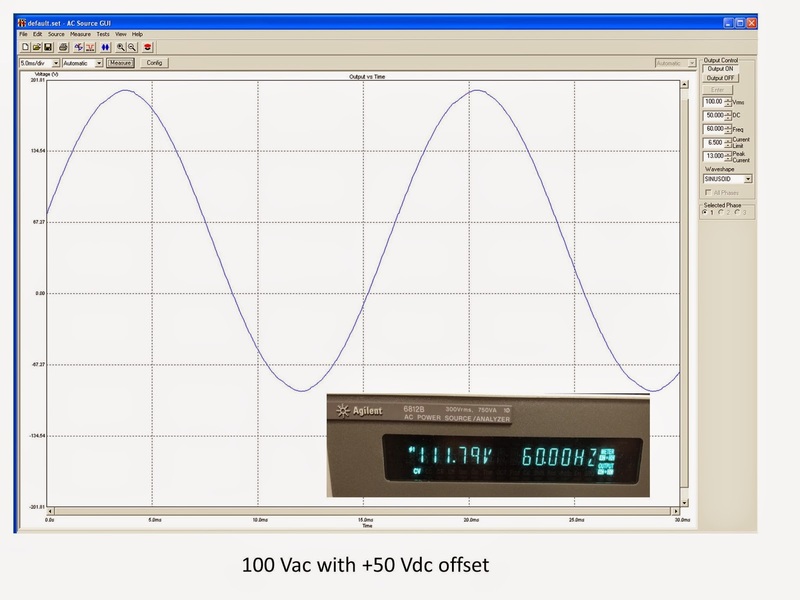 This works even if the DC value is set to -50 Vdc instead of +50 Vdc since the value is squared. And sure enough, when I set the AC source output to 100 Vac and -50 Vdc, the front panel measurement shows 111.82 as expected. The small variation in the measured value compared to the exact calculated value is due to the slight inaccuracies in both the output setting and measurement system. So in summary, measurement of an rms waveform that consists of an AC signal plus a DC signal is the square-root of the sum-of-the-squares of the individual two values. It’s as simple as that! In the figure with +offset, I can understand a positive peak voltage close to 200V, which is [100 * SQRT(2) + 50]V = 191.42. But why at time 0 when the AC is at 0V, the total voltage display is about 70V (50 * 1.414) instead of the 50V DC component. Thank you for your questions! 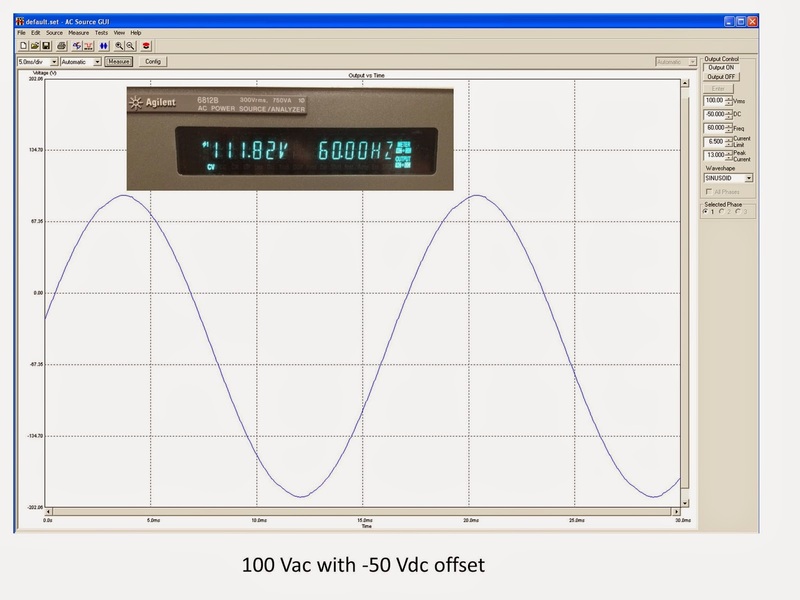 The first calculation in your first paragraph is exactly correct: the peak of 100 Vac + 50 Vdc is 191.42 V and agrees with the plot. As for the voltage at time = 0, the sine wave is not synchronized with the time scale shown. So for this example, the sine wave zero crossing does not occur at time = 0. If the sine wave crossed zero volts at time = 0, your observation that the voltage should be 50 V at time = 0 would be correct. In this example, the sine wave is shifted about 0.4 ms to the left, so the voltage at time = 0 is higher contributing to the higher observed voltage [141.42 x sin (2*pi*60*0.0004) + 50 = 71.2 V which is roughly the observed voltage at time = 0]. As for the capabilities of these AC sources, yes, the output can produce 300 Vrms or +/-425 Vdc. The 111.80 V is not the input voltage of this AC source; it is the output. Discussing these AC sources can be confusing because they have an AC input and an AC output. In this case, the 111.80 V is the programmed output voltage as a combination of AC + DC settings. For the AC input, these AC sources can be plugged into a standard AC line and the source converts the AC line voltage into a high voltage DC rail, and then uses power electronics (a sophisticated inverter circuit) to reconvert the DC into the well-regulated AC (+DC) output. So I was running this AC source from a standard 120 Vac, 60 Hz outlet and I programmed its output to 100 Vac and 50 Vdc. I could set any AC output voltage between 0 and 300 Vac, and any DC output voltage between -425 and +425 Vdc, and the AC source will regulate its output at this setting (as long as the peaks do not exceed the capabilities). The 6812B AC source I used can be purchased with one of several AC input voltage options to allow it to work from any standard single-phase AC input line in the world (100 Vac, 120 Vac, 200 Vac, 208 Vac, or 230 Vac).